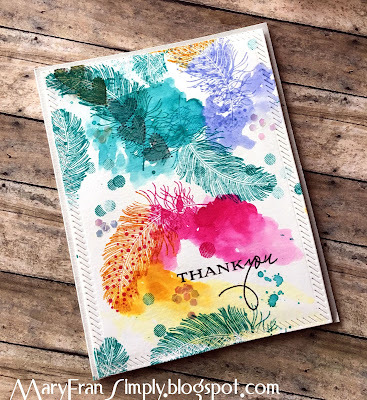 I'm entering this card for the Simon Says Stamp Monday Challenge. For this cardI stamped the medium-sized feather in the set in various colors of regular distress ink. I used the ink mixed with water to add some watery goodness (-: I then stamped the smaller sized stamp to fill up the white space. Next up I used the little circles to fill out the white area as well. To finish it off, I added some little dots in deeper orange and once all was dry, I stamped the sentiment and die cut the panel using a slanted rectangle. Thank you for reading this and the materials used are listed below. This is so cool, love the colofrul feathers and the watercolor look. Thank you for joining Simon Says Stamp Monday Challenge.